College and training providers often come to me with a need to engage and capture Generation Z. Whether it is for courses, candidates, training or volunteering opportunity, there is a real need to find a way to not just engage but to connect and capture this important audience. You're probably thinking right now 'Who are Generation Z? we just got used to the term 'Millennials'?' Well generations are generally defined in 15 year blocks, Gen Z were born from 1996 onwards, making them 5 to 19 years old now. If Gen Z isn’t your current target audience, they should be... they will be. The time to start engaging them is now! You need to think about the relationship you are building, your digital footprint and how they affiliate with your brand. Research shows that a Gen Z'er will likely research the provider before they make any concrete decision in accepting an opportunity, so your dated information and a stale website wont cut it. Keep your brand fresh and social channels engaging, this is now your first impression and trust me it counts. In Gen Z you have an audience expecting to be the largest wave of philanthropists and entrepreneurs, far likely to be influenced by real people and real stories than by celebrities. You need to keep this in mind and shift your focus on 'relationship building' and away from blanket advertising, they are an audience that have been inundated with digital advertising since they toddled over to their first mobile device and are astute in knowing what are 'real messages'. By keeping activity real and honest to your brand you can authentically tell your own stories from your own people, you not only build a connection but it goes a long way to building that trust and loyalty they seek. Sell your brand authentically through the good work you do, if you have a good news story or contribute to society in some way then its time to show it, and if you don't... then ask yourself why not and maybe it's time you start giving back! Your brand story, your legend, will be the foundation of your relationship, it’s what they are going to connect with. Provide regular updates, particularly videos and allow them time to develop a relationship with you. They recognise the importance of participating in valuable work experience early, gone are the days of working at the local leisure centre, cafe or with mam and dad for a week. They are out volunteering regularly, and some are already selling and making an impact online and even partnering with brands as ambassadors. I see them taking over companies social media channels during their stint and leaving them with digital assets and strategies to continue in their absence... in my day it was making teas and coffee's and cleaning out changing rooms, but now you have access to a real asset that can connect to your audience in an effective way. I encourage you to open your doors to facilitate work placements, there's an obvious benefit in providing the opportunity to up-skill and help make them employable, but the value to your organisation could be far greater; nobody knows your audience like your audience, nobody can endorse your brand to their peers like they can.. .embrace them! We had a great time inviting young people in to work with us, they taught us a great deal and provided us with a huge bank of resources we'll roll out with our new branding launch. 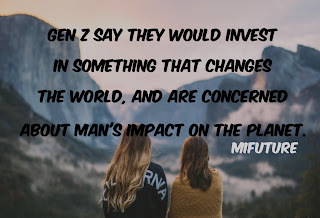 By doing the above I was able to reach a significant milestone; miFuture was recently re-branded by our Gen Z users, I learned that we couldn't go and create a brand; this brand evolved from the essence of the solution we are committed to providing. Our audience led the way and the vision, we worked for them, not with. They really wanted to 'feel' what we were about and through their direction the new miFuture brand was born. They are my tips, and some of the experience I can share with you. If you need to engage with Gen Z for your brand, then you need to engage them at all levels of your organisation.